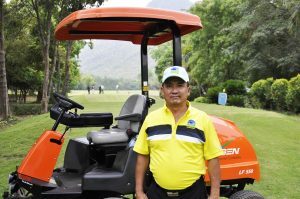 Yay Tagon Taung Golf Resort, located about 30 minutes’ drive east of Mandalay in Myanmar (formerly Burma), has taken delivery of yet more Jacobsen machinery after serving as a loyal customer for more than 20 years. Mr. Thant Zin Oo has been the general manager at the club for two years now, having previously been an officer in the army. 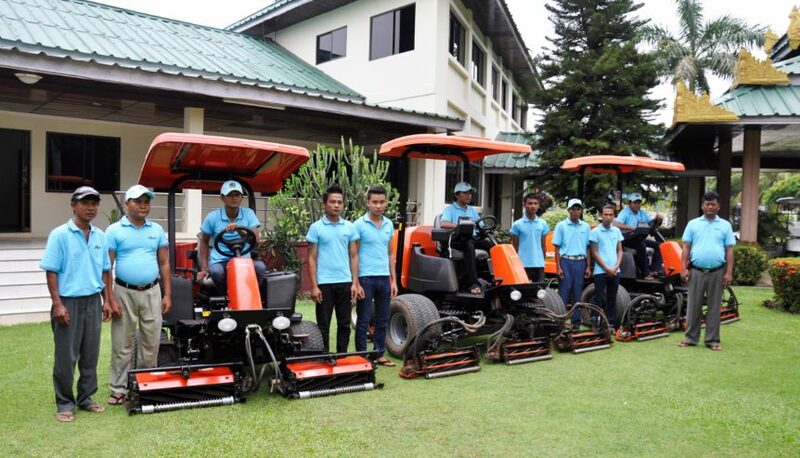 The former Pwint Phyo Thit Group owned golf club has invested in four Jacobsen Eclipse 2 green mowers, two LF550 light fairway mowers, one TR-3 trim mower, 27 E-Z-GO Freedom LXi golf cars, 12 TXT E-Z-GO golf cars and six Shuttle 4 vehicles. “We attract a lot of golfers to the club. The course has a good reputation, and we have 7,380 rounds of golf on average per month. For this reason, we have invested heavily in new machinery, and the best machinery, as the grass gets stressed due to the high volume of foot traffic; we do not have much time to get out in the morning to maintain the course. “When looking for machinery, we wanted equipment that could save us time and that left a good finish. The course condition is important here because we host many tournaments throughout the year, including an event which is part of the Myanmar golf tour. The LF550 fairway mowers and the Eclipse2 green mowers suit our course perfectly. They do not put the turf under any unnecessary stress, and they are extremely easy to use, efficient, and reliable. Yay Tagon Taung Golf Resort was established in 1996 and is located at the foot of a mountainous area, just 10 miles from Mandalay city center. The mountains are dotted with temples and pagodas, providing a serene backdrop for visitors to enjoy. The golf course is wide and open, offering an enjoyable experience for players of all abilities. For more information, visit www.textron.com.